Despite appearances, Roald Bradstock is as much an artist as he’s an Olympic athlete. True, he stands at just under six-feet-tall and has a sporty, stocky build that screams star of track and field. But what you can’t see when you first meet him is this Brit’s creative mind. Not until you’re introduced to his paintings, that is. These are works that have earned him the title of the ‘Olympic Picasso’ and now, to coincide with the imminent start of the games over in Rio de Janeiro, Brazil, he’s just launched his first Hong Kong exhibition alongside other athlete-artist talents. A two-time Olympic competitor in the javelin, Bradstock represented Great Britain at the games in 1984 and 1988. He broke a world record in 1986 as he became the first man to surpass the 80m barrier with a ‘new rule’ javelin. 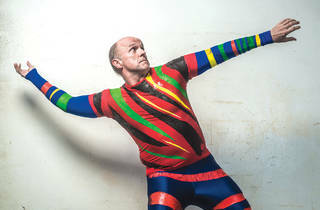 But, out on the field, he may be best known for his so-called media stunt in 2008 when he dressed like no athlete has done before in the Olympic trials, wearing three outrageously self-designed patriotic outfits that matched beautifully with his artistically painted javelins. “I wanted to respect the sport,” he tells us, “but, at the very same time, I wanted to do something that expressed myself. As an athlete competing out there, you don’t get to see all the work that’s gone in before. Painting the uniform was a way to show that I’m an artist on the outside.” Bradstock actually did it in the 2004 trials too but it went largely unnoticed, and he repeated it again in 2012 with some new designs. Bradstock says he doesn’t believe that his athlete and artist identities are separate. They are both equally important to him. “I’ve been both all my life,” notes the Olympian. “And I’ve always really struggled with this as they both require much time. When I’m focused on the sports, I can’t do much art. When I’m doing art, I can’t do as much training. It’s never one and the other.” But Bradstock never realised his actual potential as an artist until he entered and eventually won the 2000 United States Olympic Committee Sport Art Competition. Afterwards, it wasn’t then long until he received the prestigious International Sports Artist of the Year in 2003. He found his true calling in searching for ways to reduce the gap between sports and arts.